How to Tell if a Watermelon is Bad or Rotten - What About Watermelon? There is nothing worse than purchasing what you hoped would be a juicy watermelon from your local grocer, only to cut it and realize the flesh has gone bad. In this article I will give you all the insights needed to tell if a watermelon is bad. This should give you the pointers needed to avoid purchasing a bad watermelon. Prior to deciding on a watermelon always check the recommended ‘Best Before’ date. This will give you an indication of how long you have before this watermelon will begin to turn ‘bad’. Often supermarkets will put the cut watermelons with the longest shelf lives behind those with shorter shelf lives. Some watermelon enthusiasts choose to purchase a whole watermelon opposed to pre-cut quarters. Without seeing the flesh of the melon you have to base your judgement on the quality of the skin. The skin of a watermelon is thick so it can be difficult to figure out if the flesh will be juicy and fresh or not. 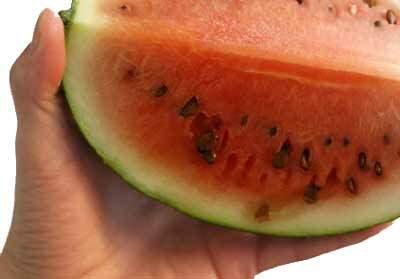 Pick up the whole watermelon and check it’s entirety for any signs of mold (black, white or green) or dark colored spots. Mold and/or dark colored spots are true indicators that this is definitely not the best watermelon to pick. Look at the color of the watermelon. 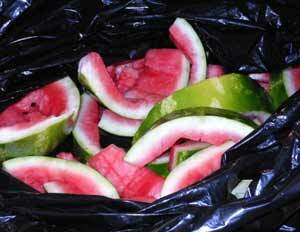 A fresh watermelon should be a pine green color often with a striped appearance. Look at the color of the flesh. A fresh watermelon’s flesh should be pink or deep red in coloring (note this may vary across different types of watermelon for example a yellow fleshed melon). Look to see if the seeds of the watermelon are intact. Often in a spoilt watermelon, the flesh will begin to shrivel away from the seeds. The watermelon should smell sweet not sour. It is important to understand that the shelf life of your watermelon will depend on how long it has been sitting in the supermarket. While big chain food retailers generally stock the shelves with fresh fruit daily, local grocers tend to have smaller turnovers. Knowing when your watermelon is considered ‘spoilt’ will ensure you do not fall sick from food induced illness. Watermelon is a perishable fruit that begins to deteriorate at a steady pace the minute it is cut. If your watermelon shows signs of any of these factors, it is always a good practice to throw it in the bin. Read more about the shelf life of whole, quartered and cut watermelon here.